CHEVY CHASE, MD. (October 26) – Local students, parents and teachers will meet Friday to learn about how they can save children who make a marathon hike – sometimes more than 35 miles through Niger's desert just to find water – by bringing them the wells they so desperately need. Ariane Kirtley, a former Fulbright Scholar who studied public health in Niger, will lead the discussion. 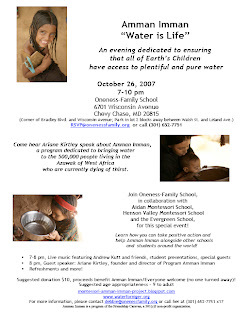 In 2006, Kirtley started a well-digging program called Amman Imman, or "water is life," to help the more than 500,000 people who currently suffer from severe water shortages in a remote region of Niger's desert, called the Azawak Valley. Kirtley classifies the Azawak as the most marginalized region in a country the United Nations ranks as the least developed in the world. Although Kirtley spent more than a decade growing up in Niger and has witnessed poverty in a plethora other African countries, she said the situation in the Azawak "blew me away. I thought I knew about water problems in Niger. I had no idea." Unlike throughout the rest of Niger and West Africa, there are no humanitarian agencies working in this area, for fear of dehydration and sickness amongst their workers. Describing the area, Kirtley recounts that it lacks elements of basic development. For instance, there are no roads or trails leading to or from the Azawak. Few schools exist in the area. The closest health center is a two-day trip by donkey. And half of children born there die before they turn five, with one quarter dying from dehydration alone. Friday's event will be a testimony to the need for this change, as well as to the worldwide movement of schools – most of which practice the Montessori curriculum - that have banded together throughout the past year to help spur development in the region. “When students hear stories about people dying because they do not have access to water, they want to help,” said Debbie Kahn, Associate Director of the Oneness Family School. “Their desire to take action has been reported to me again and again by teachers of children all around the world. It is clear that through this alliance with Amman Imman, students have the opportunity to become leaders in a grassroots movement that is bringing positive change." The alliance has flourished to include actions from 36 schools around the world, including nine in the metro area. Several more are expected to join after Friday's meeting. The schools communicate through an online blog, where their humanitarian ventures, on the part of the people of the Azawak, are catalogued. With the help of students’ fundraising efforts, thus far totalling more than $40,000, Amman Imman successfully erected its first borehole well last summer. The Oneness Family School will host the event between 7 and 10 p.m. at 6701 Wisconsin Ave., Chevy Chase, Md. Students, parents and teachers from Aidan Montessori School, in Washington D.C. , Henson Valley Montessori School, in Upper Marlboro, Md., and the Evergreen School, in Silver Spring, Md. , will also attend the event.